To be perfectly honest, I’m not a big fan of Halloween. I don’t like being scared and I don’t see the point of adults trick or treating. However, I do see the joy in my son’s eyes when he gets a chance to do a little cosplay, and I’ve been known to do a little role playing myself from time to time. So one of these years, I’m sure I’ll work up the courage to attend what is, by all accounts, one of the best Halloween events around – Universal Orlando’s Halloween Horror Nights. Beginning September 21, Universal Orlando’s Halloween Horror Nights returns for 25 nights of intense Halloween spookiness. This year, once guests step inside Halloween Horror Nights, they will not be able to escape the horror that awaits them, including terrifying haunted houses featuring some of the biggest names in pop culture – like AMC’s “The Walking Dead” and Silent Hill. And, with a completely reinvented street experience, scarecators will seek them out no matter where they turn. This year, guests will fight for survival from the flesh-eating walkers of AMC’s “The Walking Dead;” run to avoid the demonic beings from the universe of popular video game and motion picture franchise Silent Hill; try to escape Penn & Teller’s nuclear ooze-covered Las Vegas wasteland; and come face-to-face with the twisted concepts pulled straight from legendary shock rocker Alice Cooper’s most popular songs. Even more haunted house horror is in store, as well. What were once just ghastly rumors about an old, abandoned house have come to life as actual bone-chilling apparitions in Dead End; the still, stone protectors of an ancient European cathedral have awakened to fight intruders off at any cost in Gothic; and Universal’s legacy of horror continues as the classic monsters of fear appear in blinding black and white in House of Horrors. And, a completely reinvented street experience will unleash scareactors in an all-new, terrifying way. 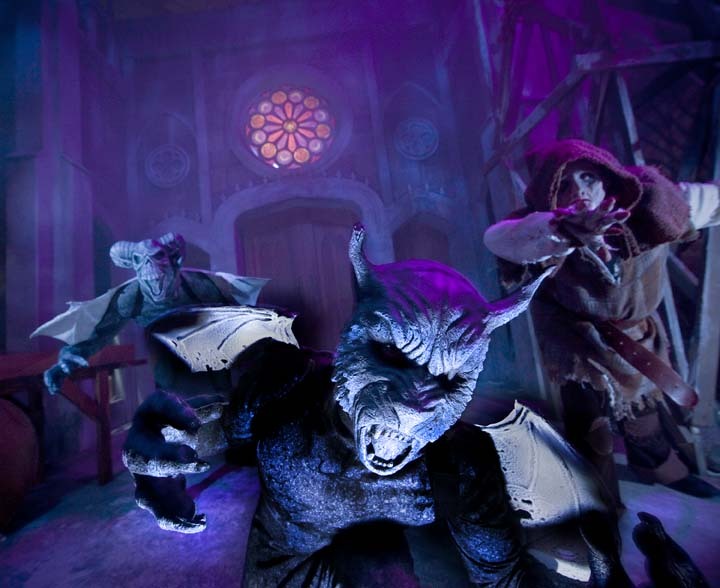 Roaming legions of menacing beasts, vampires, prisoners, warriors and more will inhabit every corner of the park. They will find you and invade your personal space like never before. There will be no boundaries. The rules of the past will no longer apply. World-renowned magicians Penn & Teller have accidentally nuked Las Vegas, but don’t worry, it’s nothing a fresh coat of paint and a truckload of BS can’t fix. Come on down to New Vegas, where all that glitters isn’t gold, and in fact probably has fatal levels of radioactivity. Journey into the legendary rocker Alice Cooper’s twisted mind and witness the natural melding of horror and Cooper’s four decades-long career. Here you will follow Steven, the iconic character from many of Cooper’s works, as you come face-to-face with a myriad of tormentors who threaten an already-decaying sense of sanity. This is no remake. No sequel. No re-imagining. These are Universal’s classic monsters of fear, who have terrified audiences from the Silver Screen. They have been waiting within silver celluloid to be resurrected. The flash of a lightning strike cuts the darkness that surrounds, and terror’s true faces take back what is theirs. The Catedral de Caementum Animus is, by day, undergoing a building-wide architectural refurbishment. By night, the many stone gargoyles that keep watchful eye over the sanctuary come to life with the mission of protecting this sacred place against intrusion. The 20 Penny Circus brings its “Magic For People With Questionable Taste” to an unsuspecting Halloween Horror Nights audience. Halloween Horror Nights runs September 21-22, September 27-30, October 4-7, 11-14, 17-21, 24-28 and 31. Tickets and vacation packages are on sale now and can be purchased at Halloweenhorrornights.com/orlando.